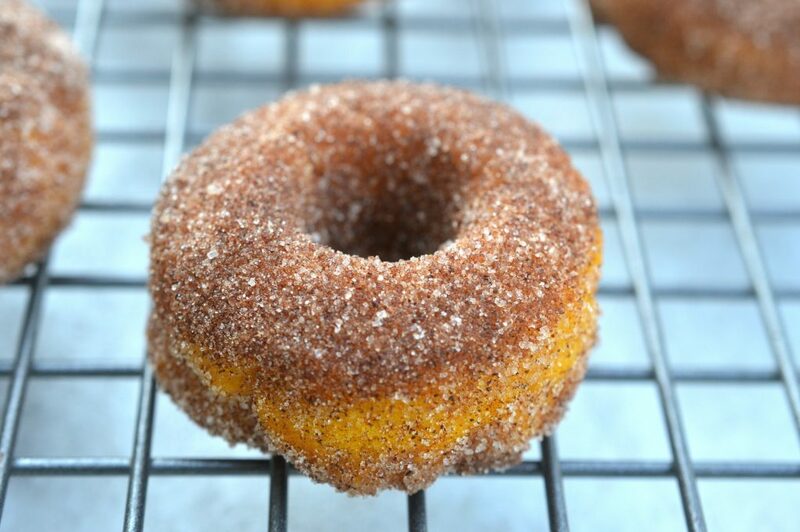 Whether you like to roast your own pumpkins or stock up on your favorite brand of canned pumpkin this time of year, these easy to make and even easier to eat Pumpkin Donuts with Cinnamon & Sugar are a perfect recipe to enjoy the flavors of Fall. 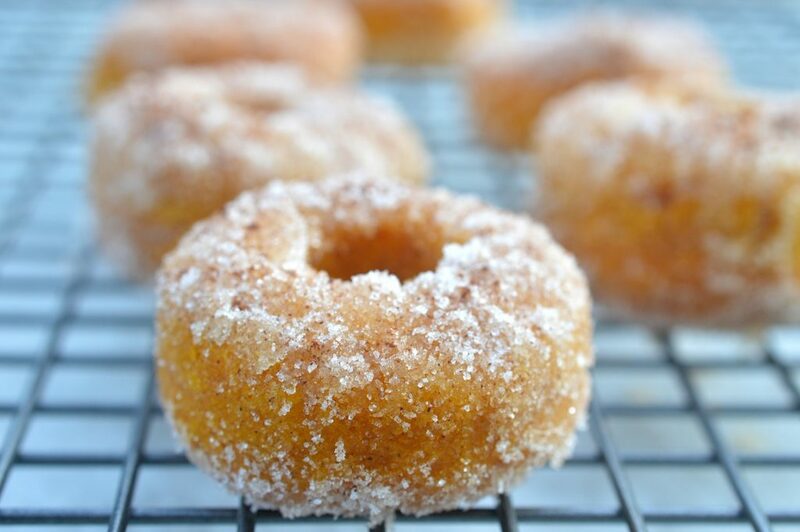 I like to make these Pumpkin Donuts with Cinnamon & Sugar as mini’s which I see as both a good thing and a bad thing! Good because, they are easy to make…Literally 2-25 minutes from the time you begin until they are in your belly! Bad because, you just pop them in your mouth again and again and again! Good grief, hot out of the oven these are so ridiculous that I have literally gobbled down 4-5 in a row more than once! My whole family as well as the kids friends, seriously enjoy these Pumpkin Donuts with Cinnamon & Sugar. What I really like about them is if you want to go crazy on the cinnamon, you can. If you want straight up sugar, you can go that too or you can go somewhere in the middle. You can add in some nutmeg, cadamom or allspice if those are flavors you enjoy as well. You really can’t go wrong with these! You can probably tell from the 3 photos I shared that one was heavy on the cinnamon (top), one was straight up sugar (middle) and one was a bit of a cinnamon sprinkle (bottom). Choose the way you want to eat them. And I apologize in advance if you eat a half dozen of these…BUT ummm, they are mini’s right?? So it’s not too bad! Plus ya know…we do pick up leaves and branches a lot in the Fall…that is a lot of calories being burned right there. Ok, now I feel better! Are you on Yummly yet? Yummly is similar to Pinterest but its alllll about the food! I have been on it for awhile and I’m having fun finding new-to-me dishes as well as building recipe boxes for ideas I’d like to circle back to. Check it out and when you are visiting your favorite websites & blogs, look for the Yum Button, which helps you easily save recipes to your account! I have some of my recipes under Souffle Bombay’s Publisher Page, which gives you a quicker way to look through some of my recipes by photo. Hopefully soon I can have all of my recipes there…Happy Yumming! **If you have cardamom add ½ tsp…the flavor is incredible! Combine flour, baking powder, salt, spice(s) in a medium bowl, set aside. Combine oil, sugar, egg and pumpkin in a large bowl. Add dry ingredients, stir until combined. Place mixture into a pastry bag or plastic baggie (snip off one corner) and fill each donut hole to just under ¾ full. Bake at 350 degrees for 8-9 minutes or until tester comes out clean. While donuts are baking, melt butter in a small bowl. In another small bowl, combine the sugar and cinnamon (and any other spices you may be using). Pop the donuts out of the donut pan (or mini muffin pan) onto your countertop or a piece of parchment paper (hopefully you greased it well and they just pop out when you turn the pan over) while the donuts are still hot. Dip your donuts/muffins one by one in the melted butter and then immediately coat with the sugar and cinnamon mixture. Place on a wire rack and allow to cool….or better yet eat a few while they are hot!! These are best eaten within 4-5 hours of making them.